We live in an hyper-connected world, overcrowded and bombarded with massive amounts of information. In this context recent studies identified works stress as the major cause of sick leave globally, and it keeps increasing. Our client, APM experts in occupational safety and heatlh, aware of this fact, intuited a business opportunity. Design is the best option when you want to go from A to B, but you don’t know where is B. We conducted and integral proyect of Design Led Innovation covering all phases of it. We helped APM to uncover people´s needs and wants through a design research phase; then articulating the gathered insights we delivered an innovative value proposition through both a product and service that are meaningful for people, technologically feasible and economically sustainable. A collaborative project with participatory design striving for a social impact. Gaining a holistic perspective on the issue through a Design Thinking approach was necessary before finally framing the Design Challenge that could afterwards lead to an innovative project for our client. Furthermore, working side by side with APM allowed us to develop a deep understanding of their customers, support managers in product planning and organizational development. During this Design Research phase we went deep into the roots and causes of work stress, identifying the key triggers and how people emotionally perceived and dealt with the sickness. More than a few interviews with reputed heads of HR departments allowed us to understand how they currently deal with work stress. Then, we also gathered the point of view from expert doctors and finally we conducted hundred of interviews to stress and non-stressed people for a qualitative and quantitative map of work stress. 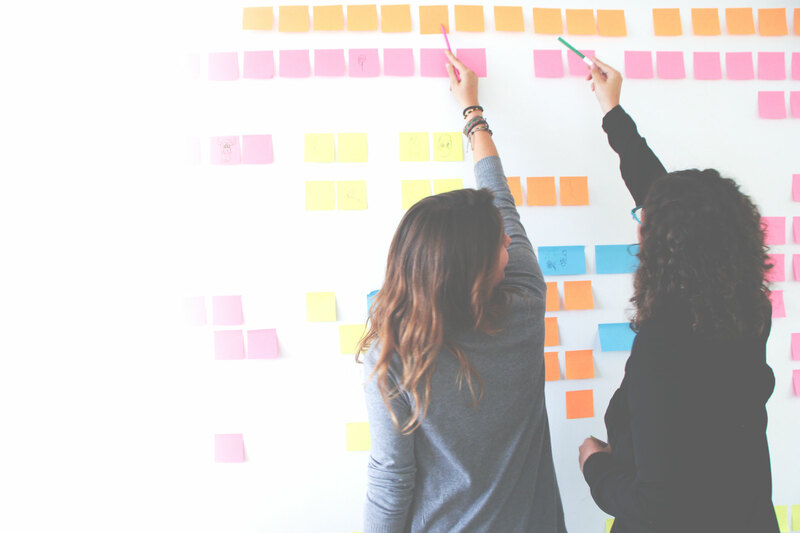 With the large amount of insights from the Design Research phase we conducted a one day creative session with our client involving the most valuable stakeholders, in order to generate ideas that would be meaningful for the whole system. Ideas generated had to answer to the Design Challenge stated before and articulated as “What if…” in order to explore new solutions and scenarios. The workshop finished with “What if we could provide people with a simple tool to be used anywhere, anytime and that guides them through a brief scientifically proved breathing technique?”. Oblow is a natural way to manage stress by learning a breathing technique using a simple device that synchronizes with the Oblow app, allowing the user to track stress peaks and exercise performance. Most part of the interviewed stressed people knew some breathing techniques but they confirmed the lack of a “tool” that helps them to actually do it with regularity, concentrate and evaluate the results, so we just listened to them and created this simple solution. During one of the interviews we discovered a bulky product called Spirometer, used before and after a lung surgery to exercise breathing muscles. The device has a mechanical system that, when the patient inspires, it indicates both the pulmonar capacity and the breathing speed. So, we already had the idea and the parameters to control for breathing exercises, we just needed the technology to create a small portable product. Along the product development phase we conducted several user tests (both for the hardware and software) to evaluate design decissions and the user understanding of the product. An iterative process that lasted a few months until the design was ready. Oblow functioning is very simple, it guides the user through light cycles, indicating the correct moment to inhalate, retain and exhalate the air. As the described Spirometer, Oblow also controls the user breathing speed so that it is within the limits of a relaxed frequence, something very challenging for stressed people. 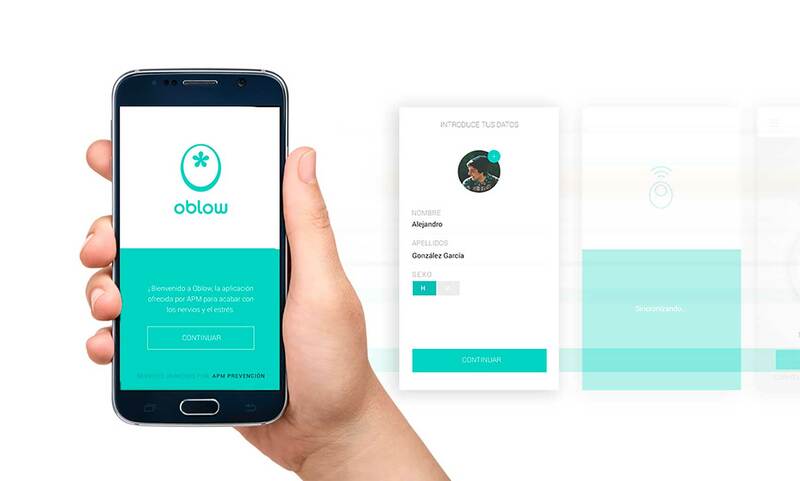 There are different breathing programs that can be configured through the Oblow app for beginners, intermediate or advanced levels in order to motivate and create a habit in the user. The Oblow app stores and graphically shows the breathing results providing insights on how to improve the technique and much more. Finally, all this creates a system that engages the person and turns the breathing exercise through a simple product into a daily habit.